The BeoVision 11 is the Danish company's new luxury TV and, as such, boasts all the technology and specifications you would expect to find for the €5,000+ price tag. Available in 40-inch, 46-inch and 55-inch variants, the display itself is a 200Hz, LED-based, LCD screen capable of 2D, 3D and Smart TV functionality. In fact, it's the first TV to feature Bang & Olufsen's own Smart TV platform, meaning you can easily pull content from the likes of iPlayer and YouTube. Given that Bang & Olufsen is mostly known for producing high-grade audio equipment, it's no surprise that one of the highlights of the BeoVision 11 is the on-board speakers. The custom-made left and right channel speakers are set directly below the screen giving the BeoVision 11 a square (rather than standard widescreen) appearance. The channel speakers each include a ¾” tweeter, 2” midrange and 4” bass speaker with a changeable cover panel available in various different colours - to match your décor. T3 was invited to a demo of the BeoVision 11 and we were impressed by both the sound clarity and volume coming from the speakers, not to mention the range of customisations available for each audio setting. Although, if you just want to sit back and watch, the BeoVision 11 has a built-in signal processing algorithm that automatically swaps the audio mode based on what you're watching – sports, movies, etc. Unsurprisingly, the BeoVision 11 supports up to ten audio channels, letting you connect an entire surround sound system to the TV and configuring it yourself any number of ways. It's a new step for Bang & Olufsen, from a traditionally closed system to effectively letting you change the tiniest aspects of audio or video performance. The company has even made a technical sound guide downloadable from its website that gives detailed instructions and information about the various tunings and settings available on the TV. Audio expertise has been matched in the video department with a number of features you'd expect on a TV at this price range. The BeoView 11 has been fitted with a 360-degree light sensor that channels ambient light down through an acrylic prism to automatically adjust brightness and contrast. Again, when T3 saw a demo of this in action, the differences in the picture were certainly noticeable when the sensor was doing its thing. There are pre-set picture modes also on offer for movie-watching and gaming and, as an added touch, when you hit the standby button the picture slides shut from either side giving you a “curtain” type effect that looks very nice. Bang & Olufsen hasn't skimped on the connections either. Round the back of the BeoVision 11 you'll find six HDMI ports, two USB slots and an Ethernet port and even a dedicated slot for Apple TV. While the majority of these are down at the bottom, a single HDMI, USB and headphone jack have been built into an easily-accessible pop-out slot at the top of the box – meaning you can quickly plug in a flash drive and start watching. The BeoVision 11 is DLNA compatible, meaning you can stream music from your smartphone or NAS drive, but the built-in Wi-Fi also means you can connect just about anything to the TV. Bang & Olufsen has also released an app for both iOS and Android letting you control the TV from your tablet or smartphone. 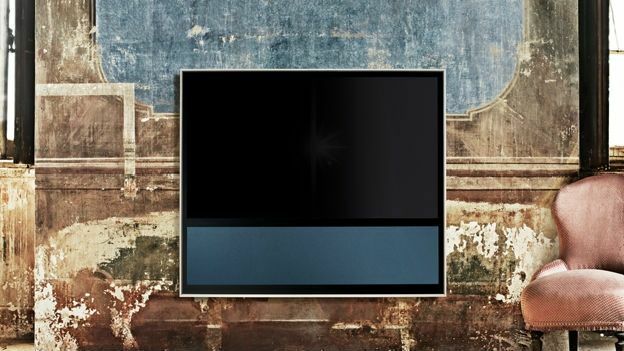 The release of the BeoVision 11 comes at a rather critical time for Bang & Olufsen. The company has just announced that sales of its luxury audio and video products have fallen by 20% from June to August, and the corollary was a dip in share price by 4.4%. The fact that the traditional luxury products aren't selling quite as well at the moment was offset somewhat by the success of the B&O Play brand that was launched at the start of the year. B&O Play produces more affordable products target towards the younger consumers and features the likes of the B&O BeoPlay A9 and the B&O BeoPlay A3, both of which have been well received. Sales of B&O Play products have risen 95% in the same three month period, the company said on Wednesday. The BeoVision 11 arrives in selected Bang & Olufsen stores today and is available with a silver or black frame and a rear cabinet in either black or white. The BeoVision 11 is priced at €5,995 (£4,829) for the 40-inch model, €7,595 (£6,116) for the 46-inch model and €9,995 (£8,048) for the 55-inch model. Additional extras are also available in the form of an integrated hard drive €700 (£564) stationary TV stand €395 (£318) or a motorised wall bracket €795 (£640).